This 2018 ACC/AHA/HRS guideline supersedes the pacemaker recommendations made in the “ACC/AHA/HRS 2008 Guidelines for Device-Based Therapy of Cardiac Rhythm Abnormalities” and “2012 ACCF/AHA/HRS Focused Update Incorporated Into the ACCF/AHA/HRS 2008 Guidelines for Device-Based Therapy of Cardiac Rhythm Abnormalities” and provides guidance to clinicians for the practical clinical evaluation and management of patients with bradycardia, or symptoms thought to be associated with bradycardia or cardiac conduction system disorders. Cardiovascular disease has now turned out to be the topmost cause of mortality in India and as many as 25% of all mortality is attributable to CVD. More than 80% of CVD deaths can be attributed to ischemic heart disease and stroke. The estimate of age-standardized CVD death rate in India is higher (272 per 100 000 population) than the global average (235 per 100000 population) according to the Global Burden of Disease study. A combination of clinical (excess visceral adiposity), biochemical (insulin resistance, lower adiponectin and higher C-reactive protein (CRP) levels), and metabolic aberrations (high triglycerides, low high-density lipoprotein cholesterol [HDL-C]) are features seen in the Asian Indian phenotype and this prevalence makes them more vulnerable to diabetes and premature CHD. Additionally, the occurrence of elevated high lipoprotein (Lp) (a), lifestyle and environmental risk factors account for the increasing prevalence of heart diseases in India. Insulin resistance, hyperinsulinemia, type 2 diabetes, impaired glucose tolerance, central obesity, hypertension and dyslipidemia (high triglyceride and low high density lipoprotein levels) are metabolic syndrome factors that make Indians more prone to increased CVD incidence. The topmost cause of arrhythmias in India is atrial fibrillation (AF) is which also a major risk factor for strokes which affect almost 1.6 million Indians in a year. Atrial fibrillation if left untreated, increases the risk of stroke by up to five times. Risk factors for atrial fibrillation in India are progressively affecting an increasing number of populations, and these include hypertension and diabetes mellitus. The magnitude of the contribution of these factors to the stroke epidemic in India is uncertain and not studied properly. According to recent worldwide epidemiological data, AF is considered a worldwide epidemic and has negative effects on long term morbidity and mortality. Indian studies have constantly revealed that the mean age of patients suffering from AF is almost ten times younger than that seen in than Western cohorts. Sinus node dysfunction causes bradycardic and pause-related syndromes which result from abnormalities of the sinus node, and artrial impulse formation and propagation, due mostly to age related factors such as progressive fibrosis of the sinus nodal tissue and the covering atrial myocardium. Sleep disorders of breathing and nocturnal bradycardias are quite common. The treatment of sleep apnea lowers the rate of the arrhythmias and may result in cardiovascular benefits. If nocturnal bradycardia is present, try checking for suspicious symptoms and consider screening for sleep apnea. Permanent pacing is not offered to patients with nocturnal bradycardia only. The occurrence of the underlying structural heart disease and diagnosing left ventricular systolic function is significantly increased if an electrocardiogram shows the presence of the left bundle branch block. 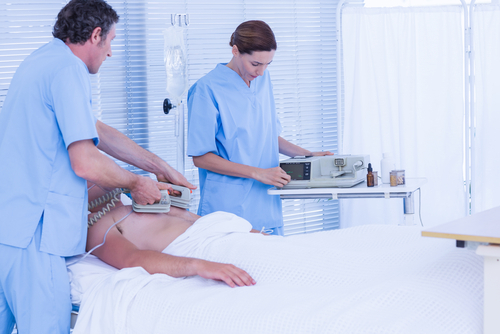 The most suitable test for diagnosing structural heart disease and left ventricular systolic dysfunction is usually echocardiography. No preset minimum heart rate or pause duration exists in cases of sinus node dysfunction which can recommend permanent pacing. To decide if permanent pacing is required, there is an important need to establish a temporal connection between the symptoms and bradycardia. Irrespective of their symptoms, permanent pacing is suggested to patients suffering from acquired second-degree Mobitz type II AV block, high-grade AV block, or third-degree AV block not due to any reversible or physiologic causes. Permanent pacing needs to be considered for all the other types of AV blocks only if the symptoms are connected with the AV block and when there are no other conditions which are connected with progressive AV conduction abnormalities. To avoid heart failure, techniques that offer more physiologic ventricular activation such as cardiac resynchronization therapy, or His bundle pacing are desired over right ventricular pacing in patients with a left ventricular ejection fraction ranging from 36% to 50% and AV block, and in whom permanent pacing is indicated and ventricular pacing is anticipated >40% of the time. Recommendations about post-procedure surveillance and pacemaker implantation are mentioned in this guideline since post transcatheter aortic valve replacement, conduction system abnormalities are frequently seen. In this guideline, collective decision making and patient-centered care are approved and highlighted in patients with bradycardia that require pacemaker implantation. The patient’s goals of care and preferences and the best available evidence form the basis of treatment decisions. Shared decision-making and informed consent/refusal is applicable even when the patient is capable of making a decision or his/her legally defined surrogate can refuse or request pacemaker therapy removal, despite being pacemaker dependent. This act will not be considered as physician-assisted suicide, but should be regarded as being palliative, end-of-life care. In cases where decisions are difficult, they should be made only after engaging all the stakeholders and the decision will always be different for each patient. Up-coming pacing technologies such as the His bundle pacing, and the transcatheter leadless pacing systems will require further investigations to identify the patient population that will maximally benefit from them before they are added to clinical practice.